This was not my first visit and it was good to return, somehow the slow pace of this place keeps bringing me back. Having crossed the Penang Bridge, one of the longest bridges in the world that connects the airport to the mainland, I chose to stay at one of the hotels in the Batu Ferringhi beach resort area. Here on the North-Western tip of the island hotels and alluring restaurants line the coast and its golden beaches. Covering 285 square kilometres, Penang is considered the food capital of Malaysia and fascinating food can be everywhere, everything from street food hawkers, casual cafes and bars up to high-class restaurants. One of the most famous eating-places in Penang is the Gurney Drive Hawker Centre, which you’ll find beside Gurney Plaza. The hawker centre is a large place with countless stalls serving all sorts of delicious local dishes such as nasi lemak, char kwey teow, Penang Assam laksa, Penang rojak, mee goreng, and much, much more. One of the most important places to visit in Penang is George Town, a UNESCO listed World Heritage Site. The city is a treasure trove of British colonial architecture from the end of the 17 hundreds which sits amongst buildings of more ancient Chinese influence going back six or seven hundred years. The buildings have been preserved and their use is carefully regulated to safeguard them for future generations. While in Penang, it is difficult not to admire the street art which is found all over the city in the form of murals, some with amusing overtones, which have been created by a young artist, Ernest Zacharevic. 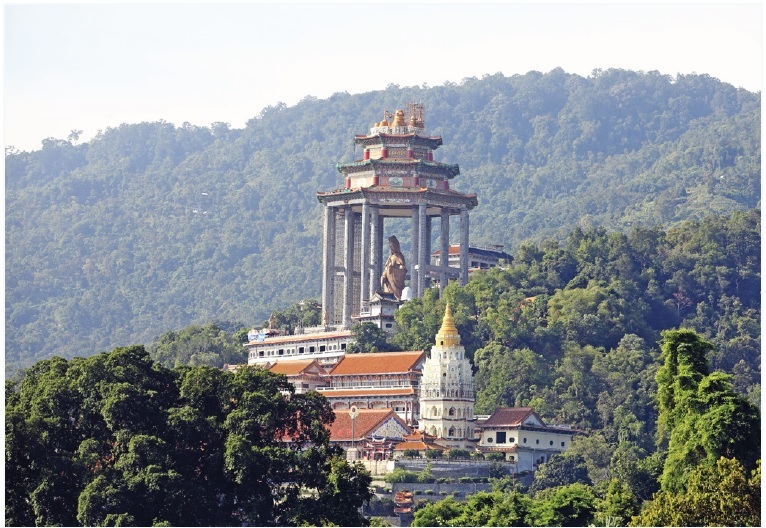 A famous landmark that is well worth a visit is the Kek Lok Si Temple, also known as the Temple of Supreme Bliss, which sits atop a hill overlooking Air Itam. This is Malaysia’s largest Buddhist temple and consists of a complex of monasteries, prayer halls, temples, beautifully landscaped gardens and a central Pagoda known as the Pagoda of 10,000 Buddhas or the Pagoda of Rama IV. The best time to visit the Kek Lok Si Temple is during the Chinese New Year celebrations when the temples are adorned with an abundance of bright hanging lanterns. Another place to see is Khoo Kongsi, the famous clan house in Penang. You can find it on Jalan Acheh, off Lebuh Pitt. Built some 650 years ago the architecture of the building, with its intricate detail and ornamentation is both beautiful and interesting. It was good to explore the old city again and, before leaving, I was sure to buy some famous Penang white coffee to bring home.